Ever wondered when the 16GB model was released? No? But will you access it from an iPhone? It seems some people might just have a little too much time on their hands. 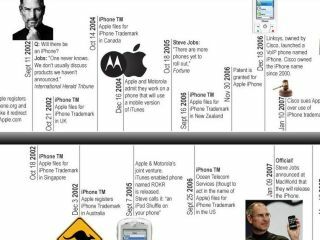 The chaps at iPhonegold.org have put together a timeline detailing all the ins and outs of how the Apple mobile evolved, from conception right through to the new iteration. There's not a lot left secret about how the device was grown internationally, as every shred of rumour was picked up and mulled over incessantly. But it is nice to watch it all unfold before your very eyes. Anyway, if you're interested in all the development, the trademark registering, the price drops and everything else, it's on iPhonegold.org's site. But be warned: it makes reference to the Motorola ROKR, the 'iTunes-enabled phone',which still leaves some tech-heads waking in the night screaming.